Missing that perfect chair to relax in after a nice swim? Look no further as the POLYWOOD® Seashell Casual Chair is the perfect choice for you. Protected by a protective coating agent, no amount of sun or chlorine will cause the poly color to fade! Whether you are hopping out of the pool or just trying to get some sun, this chair is the perfect choice for any outdoor occasion. Designed for heavy commercial use, this piece is perfect for a public park, commercial setting or busy backyard. 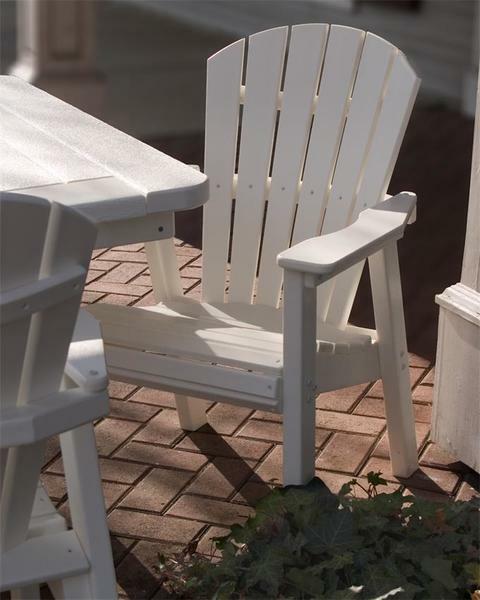 It is made of recycled poly lumber that is environmentally friendly and remarkably durable. Our tables are a great addition to any patio or deck. Boxed Dimensions - 28" x 22" x 9"
Boxed Weight - 35 lbs.